Oliver is an orphan cat that lives in New York. After helping a dog stealing some hot dogs from a hotdog vender, he decides to follow that dog to see if he can get some hotdogs for eating. The dog goes back with his friends, and they all agree to adopt Oliver among them. But the owner of the dogs is in need of earning money for paying a debt and all the pets need to give him a hand getting the money. 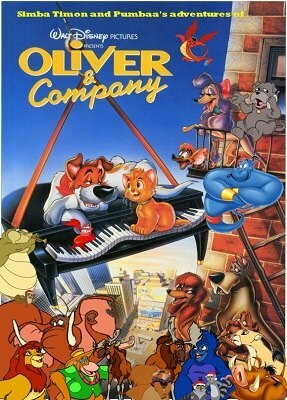 Eventually, something goes wrong and Oliver is separated from the dogs, being adopted this time by a young rich girl.